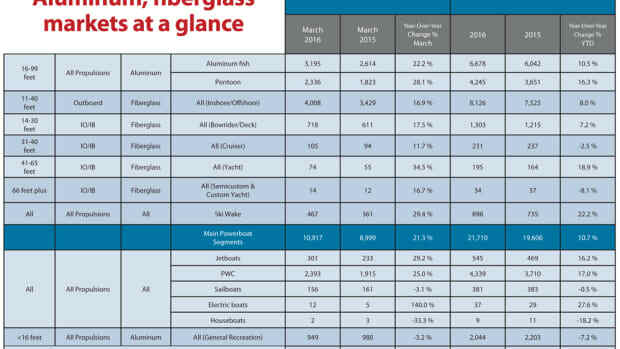 Driven by the three boat types that have been the industry’s strongest sellers since the last recession ended, recreational boatbuilders and dealers began 2017 with high single-digit January gains. Statistical Surveys said 246,891 boats were sold industrywide in those states in 2016, 4.9 percent more than in 2015. Lifted by Florida and Texas, the nation’s top two states for sales, the recreational boating industry achieved moderate growth in November that raised the year’s percentage sales gains to levels more in line with forecasts. The industry recorded the highest sales for that quarter since 2008, just before the Great Recession. The recreational marine industry’s 2016 story remains a page turner and it’s getting better. 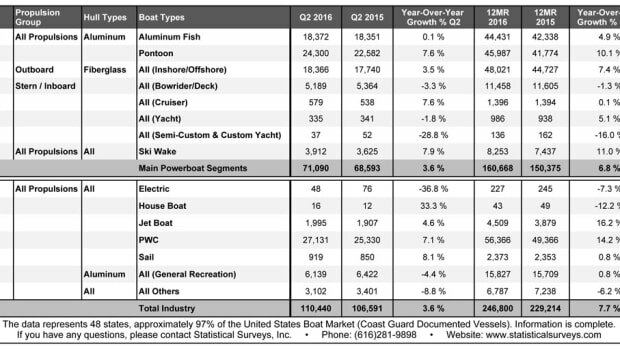 Boat sales growth slowed sharply in the second quarter as strong June numbers were diluted by weak results in April and May. When summer arrives, you need a summer fun boat. 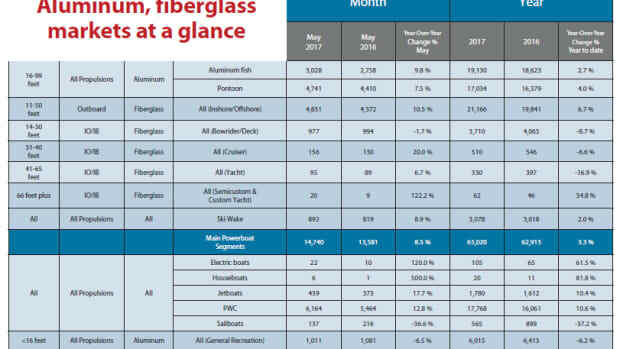 Sales of fiberglass outboard boats, and aluminum fishing and pontoon boats, rose in a range of 4.6 to 7.2 percent. 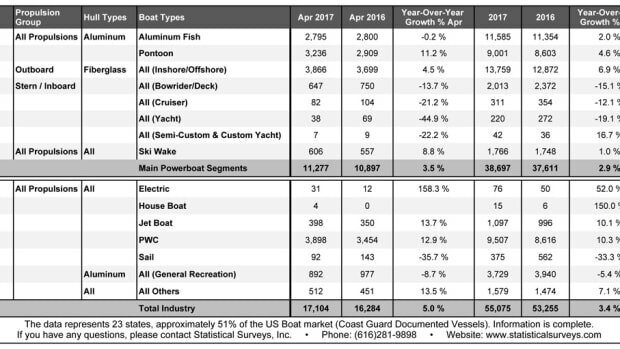 Did anyone think we would see April boat sales that even approached the 20 percent gains of March? The recreational boating industry had its best March in eight years, as sales soared 21.3 percent in the main segments and 19.9 percent industrywide. After a disappointing start to the year, recreational boat sales rebounded in February with strong single-digit gains that suggest the big Miami boat shows and smaller regional events attracted a significant number of buyers. 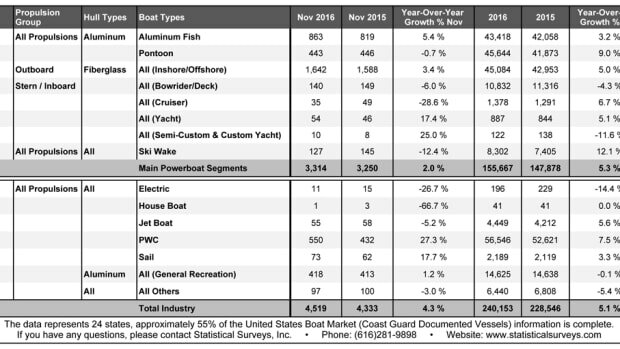 After two consecutive months of double-digit gains, U.S. recreational boat sales fell in January in the main powerboat segments and industrywide for the first time since last spring. Buoyed by a strong November, the recreational boating industry got the holiday present it wanted — a second consecutive month of double-digit sales gains in December, traditionally one of the slowest months of the year. Boat sales showed surprising strength in November, rising by double digits in the main powerboat segments and industrywide during what is traditionally one of the slowest months of the year. 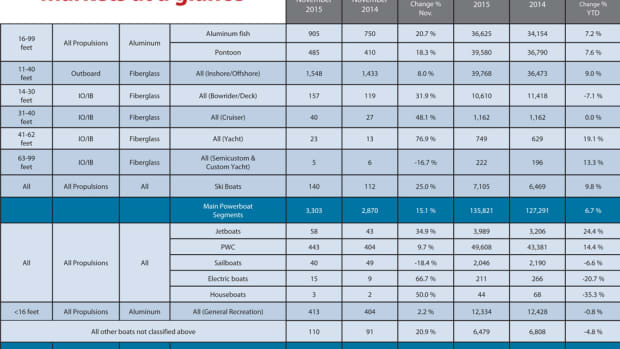 Sales rose 4.1 percent during the month to 4,779 boats in the main powerboat segments. A late spring and a summer that lingered helped the boating industry post strong September sales for the third year in a row.